I made a video for E4’s E Sting competition 2013. An E Sting is a 10 second user-created clip which E4 shows between its shows. They’re completely random – you can essentially do whatever you want with the video you make, so long as it has the E4 logo on it. It’s a bit of fun, and of course there’s a monetary incentive as well. When I saw the advert announcing the competition, I tried thinking about different things I could do for it. Mum suggested using the puzzle cube that was sat on the floor by the TV, and I thought that was a good idea. Ideas started flying through my head as for what I wanted the 10 second clip to bring. Solving a cube was one thing, but how would I actually get this to work well? In order to give the video a good ending, I thought I could turn the cube into a stamp. 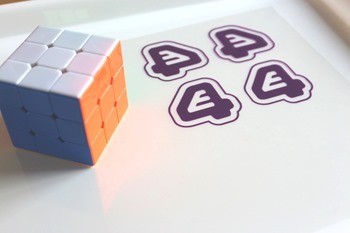 The first thing to do was to get the E4 logo onto the cube. I measured the cube, decided on the size, then printed it onto acetate. It took 3 days just to do that because the magenta in the printer ran out and I had to order some more. Once the cartridges arrived, I had a few transparent logos to cut out. I cut the logo up and stuck it on the cube with a glue stick. Because the cube acts as a stamp in the video, I had to stick the logo on back-to-front. Now, I never learned how to solve a cube like this, but luckily, my brother could. The original plan was for me to take a burst of photos above Kieran, who take the completed cube and then slowly scramble it. We’d then play it backwards to make it look like it was being solved. We gave that a go, and it looked alright, but we preferred the idea of doing this properly – recording the clip while actually solving the cube, rather than scrambling and playing it back in reverse. Many things can go wrong with that, so Kieran went away with the cube and worked out a sequence of moves which he could replicate for the clip. Frames like this would give the illusion away if we filmed in reverse – when playing it back it would look like Kieran’s finger was pulling the cube face anticlockwise. Filming resumed an hour later. Once the cube was solved Kieran slowly placed the cube on the tray we were using as a background. 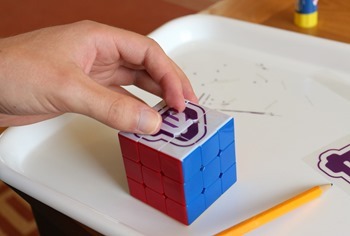 I stopped taking photos and Kieran carefully slid a transparent logo underneath the cube so that when he lifted the cube again, it would look like the logo was stamped underneath it. It took 4 takes to get the version that was in focus and without any mistakes! 125 photos were taken, which meant if I played the sequence back at 12fps, it would take just over 10 seconds. I removed a few frames from the start and a couple during the sequence to fit it to 10 seconds exactly. I picked the Disco backing track simply because it seemed right. When I added the music to the sequence, it was just sheer luck that the cube hit the tray in the background just as the sound said ‘FOUR’ – a happy coincidence. When I showed the final product to the family on the TV, dad suggested having the E4 logo on the screen for slightly longer, and to hold a frame just before stamping the background. It was a true family effort, and I think the end result worked out pretty well! The competition has now closed and the winners will be announced mid-august. There is a ridiculous number of entries – take a look at them here.